A question, purely hypothetical of course, on the topic of weekend versus weekday illness. If your child in daycare has to have one or the other, which would you prefer? And I use the word "hypothetical" in a rather euphemistic way for the very actual sense in which this may be happening to my little family right now. Assuming you work Monday through Friday (though I'm sure many of us have schedules that deviate from this traditional schema)... Would you rather that your children have a minor (+/- febrile) illness on a Friday afternoon so that you get to tend to them throughout the weekend, bringing them back to full toddler health as only a mother (perhaps a mother in medicine, indeed) can do by Monday morning? Late on a Friday so that you don't have to miss work, don't have to rearrange child care, don't have to draw upon your colleagues, your relatives, your neighbors, your spouse... Late on a Friday so that your little ones don't continue to infect peers in preschool. Late on a Friday may ruin weekend plans, but is it preferable to ruining weekday (read: WORK) plans? Or, would you rather that your children begin their minor illness on a Monday and then you get a forced opportunity to stay home for a day (probably more like two or three), put work aside, and mother them back to a usual state of afebrile rambunctiousness? Is it even possible to put work aside? As I think one of my co-MIM-bloggers described that we are in a profession where the world seems to collapse if we need to take a day (or even a few hours) away from our clinical duties at short notice. So, given that your child's minor illness will fall either on a clinical or non-clinical time, which do you prefer? And, another question altogether, whether you are a mother in medicine or not, do you dose the ibuprofen and send them off to childcare anyway? Male resident: "Is there, like, a law that every woman has to have a photo of her baby on the back of her ID badge?" Me: "Well, we can't put it on the front of the badge, can we??" So yes, I am one of the many, many physician/mamas who sports a photo of my baby on the back of my ID badge. It covers up the instructions on what to do in case of fire. I don't want to confess how much time and effort I spent picking out the perfect photo of her to display on the back of my badge. More time than I spend reading New England Journal, that's for sure. My badge has a tendency to flip around, so that instead of displaying my own photo, name, and job description, I'm walking around the hospital with a photo of a baby on my chest. I'm pretty much the epitome of professionalism. What it all comes down to though is that I love having the photo of her on my ID so that if I'm ever feeling down during the day, I can look at it and feel a little bit better. That or the huge photo album of her that I keep in my white coat pocket at all times. I must admit, I get this question a lot from my patients, friends, and family. Most of the time I try to smile blithely, shrug, and mutter something about "doing my best" or some other such BS response. I often feel that this question must be a rhetorical one, because I highly doubt that anyone really wants to know *how* I manage to live my life. The simple answer, of course, is that I *have* to! Responsibility is seldom pushed upon us in a hurry, like a ton of bricks, it is loaded slowly, ounce by ounce, pound, by pound, until, before you know it, the weight is almost unbearable. Back in ancient times, when I first started pursuing my medical degree, I was naive to the demands of the profession. It wasn't until I was nearly finished with 3rd year until I realized the gravity of the profession...how each patient weighed upon your mind, even after you had left the hospital physically. Unfortunately, I happened to fall in love with a physically and mentally demanding specialty; one with the highest of highs and the lowest of lows. I could not convince myself to turn toward the 9-5 "lifestyle" specialties, and I often feel that the specialty chose me. Long about the same time, I also happened to fall in love in a different way. This time with a person who was a very good friend, long before romance came into the picture. The solid foundation of friendship is the rock for our marriage, and has gotten us through the rigors of medical training, practice, and parenthood relatively unscathed. But with great love comes great responsibility, and too often I find I need to take more than I can give in the relationship to maintain an overall balance. Then, the greatest loves and greatest responsibilities of my life came in the form of a beautiful little girl, and a precious little boy. My perspective changed yet again, as I worked harder than ever to support their physical and emotional well being. Working a little later, became exponentially harder, and far less rewarding than it was in the days before my children were in the world. So I find myself today, bearing the great love and great responsibilities of my profession (and with that, my many patients), my husband, and my children. I find that I am just able to bear the weight of these things, and do a passable job, but I am certainly not doing it all. My health and weight are not especially great, but pushed far to the back burner in favor of "more important" things. The love of all things that I was before I became a physician, wife, and mother, like music and writing and *sleep,* has been shoved further back still. Something has got to give, and for now, it is looking like I am going to have to unload a few of these bricks so I can breathe and find out what it is like to be me again. I am starting the process of finding a less demanding position, which is temporarily adding more to the load, but hopefully, in time will afford me the ability to enjoy my family and myself once again. I have begun the interviewing process, and I feel a hope that I have not had in a very long time. Goat farming, return to residency or the status quo? I work two days a week, and I'm home with the kids for three. Apart from a full-time stint when Pete took a ten-week parental leave in 2005, I've never worked more than three days a week since I finished residency five years ago. You might assume that if I've maintained the same pattern for years, I must have found the perfect balance, requiring little review. Monday: "I've been thinking of doing another residency. What would you think of staying home for three years?" Tuesday: "Let's move to the Island and take up organic goat farming. Think how much the kids would love it." Wednesday: "Work's been great lately. Maybe we should pick up another day of daycare and increase my work to three days a week. We could use the extra cash to pay for a cleaner and meals." Thursday: "I've been thinking maybe I should be home full-time while the kids are this young. These years will be done before we know it." Friday: "Why don't you apply to medical school? You could go into family medicine, and we could share a practice. One of us could always be home with the kids." Saturday: "I'd love to throw myself into work full-time, even just for a year or two." Sunday: "Our current arrangement really is ideal. I'm so grateful that I get to spend this much time with the kids. What other career would offer this flexibility?" These suggestions, and many others, are never offered out of dissatisfaction, but out of creative optimism. An afternoon seeing prenatal patients makes me want to return to the clinic the next morning. But a morning spent hunting for crabs at the beach with the kids makes me wish for a long, uninterrupted string of just such days. I don't consider the constant consideration of alternatives pathological. For one thing, when you're a physician mother, being yanked in several directions is the norm. For another, I think it's healthy to live with intention, frequently reviewing one's choices. Before getting a new haircut, my personal rule is that I must want that cut for seven consecutive days. I apply the same basic principle to life changes. When rapidly cycling through ideas, best to sit tight with the status quo, unless an option eventually emerges as the better one. My fantasy pendulum swings equally in both directions - increasing time at home and at work. The average of all ideas I toy with is exactly what I'm doing now. Looks like for the foreseeable future I'll continue seeing patients on Tuesdays and Fridays, and spending the rest of the week sharpening pencil crayons and picking berries in the woods. For awhile now, I've been in a subclinical funk about work. Don't get me wrong, I love my job and what I do, but over the years in my present position, I've been acquiring more and more responsibilities but not more time or support to do them. Some of it, I'll admit, is self-inflicted. I've taken on a bunch of research projects and mentoring, all important for my academic career and all things I've been told I should be doing. Other responsibilities have insidiously appeared on top of what I already do, or have mushroomed out of existing roles. I've been wanting to say something to my boss. My feelings, though, of disgruntlement have waxed and waned. One day I came into work, so fired up by my thoughts of injustice on the commute in, I furiously scribbled a list of Things I Do as ammunition. I need more protected time. But, things were busy that day and the list got pushed under a million other things, and by the time I remembered, the fire had smoldered and I thought, it's not that bad. Another thing was holding me back. Among my colleagues, I am the only one with children. I've always feared that saying something about wanting a decreased workload or other dispensation would automatically trigger the - oh, that's the (weak) mother talking. At times, I feel like I need to prove myself as extra-productive to counteract such thoughts. Look! I can do all of this despite having kids! Yet, the last couple of days were so overwhelmingly hectic that I again felt that need to have The Talk with The Boss. I talked it over with my husband and he agreed: I was doing too much, especially now while I was still nursing my son. But, do you think I should even mention family issues? I really didn't want to. Yes, it is part of the equation but it's not a part I'm willing to admit to my work (male) superior. So, I sat down with The Boss and explained what I felt. I went over my projects and significant responsibilities, and asked for more protected time. I wish sticking up for myself was easier, and that I didn't feel such hesitance due to my mothering identity. Maybe I would feel the same way, even if I didn't have children...women tend to be not as good negotiators when it comes to our jobs. The extra protected time, though, is a serious boon. I'm glad I said something. Three years ago, I was finishing my first year of general surgical training. I’d love to say my husband was by my side, but he was at home, and I was spending six months in a dingy flat that used to be accommodation for psychiatric patients. It was my first six month rotation away from home, and hopping in and out of the cold bed multiple times on call nights felt pretty lonely. One night, non-medical hubby asked me to make my career let me sleep at home. Not one full week later, I was approached by my final year tutor and asked whether I would consider a research degree. Bingo-shezam! I had my solution. Not four months into my PhD program, I turned thirty. Vaguely thinking of fertility and body-clocks, I stopped taking the pill to “see what would happen”. Bingo-Shezam! Doing self-directed research with preggo brain was a challenge, to say the least. The internet, prime procrastination tool, is just there behind that stats program window! Frantically, I finished what I could and sailed out on maternity leave, just in time for Christmas. Four weeks later, my beautiful Miss Z arrived in a fanfare of electronic beeps, hustled epidurals, botched large-bore IV cannulae and theatre lights. She has felt at home in the spotlight ever since. When I returned to study, I compared notes with my clinical friends. I realised I had found the perfect maternity break. Not only had I managed to sneak it in before my ovaries failed, I also had flexibility. The latish start; the early childcare pick up; the day off when she was sick: all unimaginably difficult as a surgical trainee. I even started to congratulate myself - who said there was no good time? Who said you couldn’t have it all? Miss Z is now 2, and she has been joined by cuddly Mr J, 10 months (who has always been more reserved). I am about to return to the wards, and fellowship exams are just around the corner. I seemed to have blocked out my last few clinical rotations. I have vague memory of having to work weekends. I did have to work late a few nights as well, now that I think about it. Studying was pretty time-consuming too, I recall. I thought I had found the perfect compromise, and my life was easy. I can no longer even imagine how much I loved helping patients; fixing them. Instead, I can only imagine the wrench of losing wriggly toes in my bed at 7:30, and giggling bathing at five. When I planned parenthood, it felt like something I could control. I could decide what my obligation would be, and what I would expect in return. There would be no compromises, and everyone would be happy all the time. Luckily, it is much more fun than that. But I still haven’t figured out the perfect maternity time. Have you? Dr. Cris Cuthbertson is a surgical trainee in Victoria, Australia. She is currently midway through a PhD on pancreatitis, and will then return for two more years as a registrar before sitting for her fellowship exam. She is a mother to two children - 2 year old Z and 10 month old J. She maintains a blog at www.applequack.com, which is focussed on medical productivity, with discussion of medical applications of Mac software. Burning the candle at both ends is dangerous...eventually you get burned. I slathered Silvadene all over my ego and am feeling somewhat better. Intellectually, I realize that I'm trying to do too much - mother, wife, blogger, beader, friend, teacher, physician. I can't do any of it well. Something had to go. I gave up my scheduled lectures to the medical students. Yes, I'll miss it, but it's one "extra" that I could easily shave off the to-do list. I'll still have first and second years working with me now and then, so it'll keep me connected to the university. Meanwhile, the house is a disaster. When I get home, I'm too tired to tackle the piles of stuff everywhere. My colleague said it best: I need a wife. Do you think Husband would mind? Me: Which mold do you think we fit into? I ask husband who is enjoying his Father’s Day repose in front of the US Open. Husband: (grins) I don’t know. Me: Are we the equally shared parent group or the involved dad married to stressed-out working mom? Husband: I think the latter would be more accurate. We’ve actually tried on most of these molds in our marriage. There probably was a time as a pediatrician and mother that I thought I knew best. My husband and I have certainly butted heads about this – my husband being more of an authority on the male half of our species than I. Time has taught me that I may be an expert on some matters relating to children, but I always have a lot to learn about my own children and their version of human nature. I’ve also learned how capable my husband is at dealing with our family – that at the end of the day if all are fed, healthy, and content that matching socks, extracurricular activities, and thank you notes can go by the wayside. The stay at home dad experience was our failed experiment. After a challenging experience with a nanny, my husband decided to be the stay at home parent with our then seven month old son. Belkin and Marc Vachon (one of the interviewed fathers) say that this parent is “cooed at for his sensitivity but who is isolated and financially vulnerable as the stay-at-home mom.” That pretty much hit the nail on the head. Living in a small, conservative town worsened the loneliness for my outgoing husband who was used to the daily traffic of his office. Ultimately we moved to a larger community so that we could find support and reinvent our parenting roles. Our current mold is a hybrid of stressed out mom and 50:50 parenting. Some days are 10:90 when I am on call and my husband picks up, feeds, and completes homework with the boys. Other days are 50:50 when we divide and conquer the birthday party gift-buying, drop off and pick up. The stressed out part comes from my own personal parenting standard getting in the way of just doing it. I don’t always know where these standards come from, but they are very persistent and immediate. This week is a good example. The boys are enrolled in soccer camp, and I have found myself micromanaging the clothes, water bottles, and drawstring bags for each day. I don’t have any idea where this standard comes from that both boys need to have these things and look like they’re playing in the World Cup. With the exception of reading articles about co-parenting in the NY Times magazine, I think less about the division of labor in our household than I used to. Keeping track of how much work at home each parent does isn’t very fruitful. It either makes me anxious that I haven’t done enough and I overcompensate (read stress out) or I’m resentful that I have so much to do in a short period of time (more stress). Looking at the big picture helps – the important things are getting done and accomplished. What didn’t get done probably didn’t really matter that much. I recently gave up nursing. That part was hard. Giving up pumping was easy. I'm going to go out on a limb and say that nobody likes breast pumping. When you're nursing, there's that wonderful bonding... but when you pump, it's just you and The Sucking Machine. It requires a tremendous amount of dedication for any woman, but I really think that it's harder for a physician-mama than most. And even harder if you're a resident-mama. The problem with being a pumping resident is that there's no natural break scheduled into the day where you can retire into the coat room with your pump. On clinic rotations, I usually ended up working right through lunch, so no free time there. On ward rotations, there was usually some downtime, but I always lived in fear of hell breaking loose mid-pump. And ladies, is there anything more embarrassing than answering a page with your pump going in the background? Some women I know in non-medical professions told me that I "have a right to be given time to pump!!!" (Note the use of multiple exclamation points.) Unfortunately, it doesn't really work that way in the hospital, especially if you're the lone resident on the ward. Nurse: "Mr. Smith is having 10 out of 10 crushing chest pain and shortness of breath!" Me: "Sorry, I'm on a pumping break. Try me again in 20 minutes." Since I had no office, most of my pumping for the first three months was done in a "family room" on the inpatient ward, which was usually unoccupied. Unfortunately, the room had a bed and several patients' families were convinced I was going in there to nap. I wish. After that, I moved to a different hospital and I had two choices for pumping: Empty Patient's Room or Glorious Pumping Lounge. Glorious Pumping Lounge had everything but a running waterfall in the background, but it was a five mile trek in hiking books from my ward, so I usually opted for Empty Patient's Room. And routinely got walked in on by the janitorial staff. I managed to pump until Melly was seven months old, exceeding my goal of 6 months, and I nursed quite a bit longer. I think I did good. Next time I'm going to go for the whole year. My three daughters are now just in and out of college. Somewhat to my chagrin, not one of the three has any interest in science or in medicine. I am the child, niece, cousin and sister of physicians, and I wonder what this means. I have certainly loved having a profession, and I don't think my children have suffered from any lack of my involvement in their lives. (If anything, they have benefitted from me not helicoptering over their choices and experiences.) Yet when it comes to choosing a career, they look to their father and their peers. All are aspiring to change the world in some fashion, but medicine no longer seems to promise that, as it did when I was going into the field. Remarkable lack of interest in medicine in the children of female physicians was noted by Diane Shrier in her research on mother daughter physician pairs. I wonder if the children of male physicians, or the male children of female physicians, are any different. During my last month of internship, I discovered that, much to my delight, I was nearly two months pregnant. About week or two after my positive pregnancy test, after a particularly rough call, I started bleeding. Then cramping. When the pain got unbearable, I talked to my senior resident about it and she suggested I ask the chief resident for help. I had one short call left the next day with a doctor's appointment in the afternoon, and I asked if I could have coverage only for the admissions until 10PM. The chief agreed. An intern was pulled off their cardiology elective for that day and would cover my admissions from 1-10PM, then have most of the next day off as a reward (while I covered the post-call issues). I spoke to the covering intern, told him what was going on, and he told me he was glad to help me. Silly me, I first thought that the email was to wish me well. Instead it was a nasty email, criticizing me for not taking that call. Saying that I was imposing hardship on his poor roommate, who was studying for the Step 3 boards. (I was actually pulled to cover for someone close to my boards too.) It ended by saying that he wanted me to "reduce my leave". Even though everything worked out in the end, I will never forget that email for the rest of my life. Even when I'm old and senile, this will be the story I'll be telling my bored family members over and over. I finally emailed the resident a year later and told him (politely) how hurt I was by what he said to me. He wrote me back, saying he wished me well, but did not offer an apology. All this for taking ONE NIGHT off while in the middle of a threatened miscarriage. Not even a whole day off. Thus is internship. I hoped I was an exception, but I recently spoke to another resident who had an almost identical experience. After a particularly difficult call while she was pregnant, she started bleeding and cramping. (This seems to happen a lot... we should start a Bleeding Pregnant Residents Club.) She was allowed to take one call off, but all the other residents were suspicious and critical of her. And she had to make it up by working the next six weekends in a row or something insane like that. So that is my experience with pregnancy in residency. Proceed with caution. "I'm going to love you every day, and I'm not even going to skip a day"
"I had a dream that I loved you"
As a post-script, allow me (a mother in medicine) a brief shout out to my own father (neither a mother nor in medicine, except he was the latter, I guess, as a patient succumbing to cancer over 15 years ago). When I casually mentioned to my daughter that the Berenstain bears book we were reading was one that "my parents" read to me when I was little, she asked, "Who was the Daddy?" For the first time a clear reference to my father, her should-have-been grandfather. And I told her, "He was a wonderful man who read me books and taught me to swim." I miss father's day. Happy Father's Day to all of the men that help us do what we do! My gift to you is a heartfelt quote from John Gregory Brown in Decorations in a Ruined Cemetery, 1994. There's something like a line of gold thread running through a man's words when he talks to his daughter, and gradually over the years it gets to be long enough for you to pick up in your hands and weave into cloth that feels like love itself. This is a shameless plug for an excellent writing conference that I attended this spring in Boston. Publishing Books, Memoirs and other Creative Nonfiction (aka Harvard Writers) is a classy conference directed by tireless and enthusiastic Julie Silver, MD. Authors, agents, editors, and publicists gather to teach the medically minded about the publishing world. I even got 25 CME credits for attending! One of the standout presentations, and there were many, was Pauline Chen, MD. Dr. Chen's first book, Final Exam: A Surgeon's Reflections on Mortality, is a New York Times Bestseller. She shared with us her Top 10 Pearls about writing in David Letterman style. 1. Trust no one - trust only your voice and find it by reading and lots of writing. And in case you think I've lost my mind and forgotten that this blog is supposed to be about mothers in medicine, writing makes me a better parent and I hope a better physician. Maybe it's the political climate, maybe it's too much JennyMcCarthy's rant on vaccines and autism, but medicine seems to be taking a beating. It's important for those of us in the medical trenches to have an outlet to be heard. Honor and integrity still exist in medicine, and we are uniquely positioned to tell that part of the story by wearing our mom and doc hats simultaneously. Write with abandon! I give all the female pre-meds that I meet the same possibly controversial advice: If you want to have children before age 30, you should seriously reconsider your decision to go to med school. Of course, a lot of women don't go to med school straight out of college. I was recently talking to a 30 year old woman who was considering starting med school. With medical training lasting anywhere from 7 to 10 years, a 30+ year old female starting med school doesn't have much choice but to try to spawn during the training period. So the next obvious question is, when is the best time to procreate during medical school? First year: Might be a good time, provided you give birth to a magical baby who sleeps all the time, allowing you to study... in contrast to most babies, who require constant attention all day and night. (I don't have a magical baby.) Also, is formaldehyde teratogenic? Second year: This year pretty much revolves around STEP 1. If you get pregnant this year, you risk having preggo brain (a scientifically documented condition) or possibly milk brain (also scientifically documented) during Step 1. And then OMG, you'll never match in dermatology!! Fourth year: This year is basically like a paid vacation (except in bizarre-o world, where you're the one who pays your employer). You're supposed to take classes that will help you for residency, but who are we kidding. Theoretically, this is the best time to have a baby. Cons: then your intern year starts and you still have the baby. Still to come: When is the best time to have a baby in residency? Stay tuned! By the time I started medical school, the drive to succeed had impregnated my dura mater. It had always been all about getting the best grades, doing the best extracurriculars, getting into the best college, logging the best pre-medical school research, and finally, getting into the best medical school. When I heard the same lecture as Fizzy's OB, the one about rates of fertility declining after age 30 and rates of chromosomal abnormalities increasing, I have to admit, I, and I'm sure a good percentage of my female classmates, had a small identity crisis. I remember having conversations with my female classmates and friends about how would we balance the pulls to start a family and career. I remember feeling confused and frustrated and conflicted. As much as I wanted to succeed academically, I wanted to be a mother too. Maybe more so. Nevertheless, I pushed on and got into that hard but glorified residency. Along with me, several of my female medical school classmates did as well. Deborah* was one of my residency class who went to medical school with me. She was a serious student with a long history of overachievement. I was honestly surprised when she got pregnant during residency and even more surprised to learn she was planning to take a non-academic "cushy" job after finishing (that younger me felt threatened by the word 'cushy'). "I'm getting off the train," she confided to me. Now, with my second child just being born, I've been thinking about the train. After residency, I transferred to a slower train (probably a local). The transfer itself was a bit unsettling: going from a modern, shiny, speeding express one to a bumpier, older, slower model, but I've grown to like this train. I'm still enjoying the scenery going by, and I've taken advantage of its multiple stops. I like the promise of a career destination. But, I also wonder if, in the future, I'll ever want to get off entirely and whether I could ever be okay with that. Or whether I'd ever regret not going faster. When I first started my residency, I felt like a pregnant teenager. I was the youngest of all the residents (the oldest of the bunch being close to forty) yet I was the only one who was even close to being a parent. Of course, most of them were single guys, who talked about barhopping at lunch while I was feeling the baby kick. I can certainly understand why female physicians wait so long to have kids. Residency is really hard as is and it seems like you've got to be out of your freaking mind to get pregnant during that time. But I saw my mother struggle unsuccessfully with infertility in her late thirties, so for me, waiting wasn't something I felt comfortable doing. In less than a month, a new crop of residents will be graduating. I see a lot of the female graduating residents have little baby bulges and I admit I feel a little jealous that they managed to somehow stave off the baby fever through residency... and now they get the luxury of working a cushy part time job while taking care of their baby (or so I'd imagine in my jealous little fantasy). I wish I could do that, instead of doing my double baby/hospital calls. But I'm happy with my choice too. Husband is out of town. The person who said she would be on call to pick Son up if I had to work late forgot and made other plans. So after calling half the world and not finding anyone at home or on mobile phones, I decided to pick him up from daycare and bring him back to the hospital. After all, I had only two patients left to see, and both were "easy." First we went to the cafeteria, where I let him pick out his own dinner, which we put in a to-go container. Next we stopped at the gift shop and bought a coloring book and crayons. We then went to the telemetry unit, where Son was an angel. He sat at a desk eating and coloring while I saw a patient. Next, and this is where I question my sanity, I decided he was so good on the telemetry unit that I could take him up to the mental health unit. One patient. One easy patient. And nothing ever happens there. After asking the charge nurse if it was OK, I parked him at a desk in the nursing station and got him all settled in with his crayons. I kissed his cheek and told him I'd be right back. And then it happened in a flash. A wild man, twenty-something, ran out down the hall screaming, "I'll kill you all!" Nurses surrounded him but he was very, very strong. Security guards appeared out of nowhere and tackled him. Needless to say, Son didn't need to see that. I was nuts to think he'd be OK up there. So I got him outside and we sat at a picnic table and waited for PaniniFreak to come get him. And then I went back for my one easy patient. Funny, that patient wasn't so easy, after all. At home, I asked Son if he had been scared by that man yelling. He seemed to not know what I was talking about. Mommy of the year I'm not. The pediatrician diagnosed Squirtlet (age 7 months) with an ear infection today. ‘Yup, left ear looks really red. That probably hurts.’ She’s been sick for 5 days. I keep telling my husband that it’s just a cold, a virus, and will get better. After all, look at all of the goop draining from her nose. Last night she screamed for half an hour, despite motrin, tylenol, and the panacea for all things, nursing. This delightful episode triggered the inevitable call to the pediatrician’s office, where Sue, the efficient RN who triages sick appointments, got right to the point. ‘Does she have a fever? Is she pulling at her ears?’ We were deemed worthy of a visit, although I got the sense that Sue could make this diagnosis over the phone. In the interest of full disclosure, I work in an emergency department. I diagnose otitis media several times daily. In kids. With confidence. Yet, I find myself curiously unable to make clinical judgements for my own children. Is that ear really red? Did he just scratch his face, or is it impetigo? (answer: impetigo). I feel like I need to find the ‘right’ time to take the kids to the pediatrician – that day when the cold turns into the ear infection, or the fever has gone on just one day too long. Yet, I become a victim of my own anchoring bias: if I waited too long last time and the ear infection got really bad, then THIS time I show up on the pediatrician’s doorstep for a temperature of 100.1 and an isolated sneeze. She reassures me in her best Doctor-to-Mommy voice that my wee one will be just fine, while I apologize profusely for wasting her time. On the way home I resolve, yet again, to exercise my clinical judgement the next time around. This sets me up neatly for another episode like today’s. Tonight I am combing the internet for the perfect pediatric first aid kit to keep at home in case of a Real Emergency. I hold out hope that, when something serious happens, I will know what to do. You didn't tell me you're a doctor! Our painter, a fifty-something fellow, has done many jobs for us over the years. He works hard, grunting and thumping and wheeling the roller around whatever room he's working on. I commented once on the superb quality of his work. He responded kindly, "I'm sure there's something you're good at, too." Months later, touching up our living room, he caught sight of my medical degree tucked in a corner of a bookcase. "You're a doctor!" he said accusingly when I saw him next. He felt deceived because I hadn't volunteered that information. This has happened to me on many occasions, where someone who has known me only as a mother discovers that I am a physician. A neighbour is seated in the clinic waiting room and is shocked to see me with a stethoscope around my neck. A mother at the playground asks why I'm carrying a pager, and is taken aback when I explain that I'm on call for the clinic. The response is usually dismay, and I know it's because they are madly working to mentally recategorize me. They're disconcerted because they realize they've been using the wrong set of assumptions. The response to both occupations bothers me. I resent being patronized as a mother, and I feel embarrassed when I'm congratulated for being a physician. While doling out hot dogs and orange drink to my kids at the school barbeque recently, I remarked that the energy and enthusiasm of students made teaching look attractive. A teacher grasped my arm and replied earnestly, "And I'm sure you could do it, one day!" What was I supposed to say? I just nodded and thanked her. The vast majority of our TV viewings these days are dedicated to the Disney Princess Sing-along videos. The songs in these videos feature only the princesses of the Disney movies, such as Sleeping Beauty, Snow White, Cinderella, Princess Jasmine, etc. Melly loves them so we've been subjected to each of these videos roughly five thousand times in the couple of weeks since we've discovered them. It's gotten to the point where I'm subconsciously humming "A Whole New World" while examining patients and they look at me like I'm nuts. Between each of the songs, there's a narrative that I find rather disturbing. For example, after the Cinderella song, the narrator states: "Cinderella finally lived out her dream of going to a ball in a beautiful dress. Is that your dream too?" And so on. 1) Princesses who have developed a deep malaise, which can only be cured by an exciting new man. 2) Poor girls (usually also abused by their stepmothers) who are eventually saved by a handsome prince, often met while wandering through a forest and singing. When I was in medical school a male attending physician told me that no matter what I did, things would always be different for me because of my gender. His words rankled - this couldn't possibly be a good thing - so how I tried to prove him wrong! Anything that a male medical student could do, I could do better - and was rewarded by all of the "perks" that came along with great performances. When it came time to match, neurology was my program of choice and I started my program with the same gusto I had shown as a student. Oh, there was one exception: right after graduation from medication school, I got married. But being married didn't seem to put too much of a damper on my enthusiasm for throwing myself into my work and I continued to shine, collecting various awards and accolades through the first 3 years of residency. As my final year of post-graduate training approached, it became time to name the new chief residents. By then, I had an announcement of my own - I was almost 3 months pregnant. I had told only my program director, believing that he should be able to schedule around the time I'd need to be away from hospital duties as early as possible. Shortly after giving my news to the program director, the chief of neurology summoned me to his office. As I sat down, he greeted me warmly and spoke in glowing terms about how well he thought I had performed during my residency. Then he said this: "Artemis, I think you should be chief resident. Everyone that I've spoken with thinks you should be chief resident. But I'm going to name John Smith* chief because you're pregnant." You can be angry for me because of this. I'm not (anymore). I'm not sharing this story because I've carried a grudge through the years; I'm sharing it because it was this event that brought me full circle, depositing me right back at the attending who stated that things would always be different for me due to my gender. Ultimately, he was right: I'm a woman, and I'm a mom - and this will always color the way I practice. The stories we share here have a common thread, but are unique to us because we're moms. You won't find these same stories on a blog written by men, even if they're up for Father of The Year award, because things are different for us. And that is a good thing. Thanks for sharing our times and our stories. To say that pediatrics has altered my outlook on life is the understatement of the last general election. Take my children, for example. Most of my parenting decisions come from 1) gut response 2) experience from pediatric residency 3) pediatric practice or distant #4) indoctrination from my own parental units. For several years William and Harry have requested some type of reptile coming to reside at our house. I have a difficult time calling a reptile a pet since they are neither cute nor cuddly. The joint Pediatric camp says “Are you crazy? Turtles, lizards, geckos, etc. carry salmonella and shigella and can give you bloody diarrhea just to start.” Flashback to PICU patient seizing with generalized shigella infection. Finally the Parental/Growing up experience has no comment because I grew up in a house full of girls who had nothing to do with reptiles. The issue of “heelies” has also come up with the two boys in my life. “What about the classmate with the two broken elbows from last week?” The Pediatric Camp volleys. “We’ll wear pads.” H and W say simultaneously. “Yeah, right.” We’ve already paid a small fortune or at least a couple of house payments to our friend the orthopedist. Let’s not add our friend the ED doc to the family payroll. Another flashback to PICU patient with head injury seizing in the unit – maybe I just have Pediatric Post-Traumatic Stress Disorder. And then there are the video games which are heavily regulated by the Homeland Parental Unit (HPU). E rated and the occasional T rated games only. Every now and then the HPU catches Harry sneaking next door to play M rated games with the neighbors. Gut response wants to know how long it will be before William or Harry go postal and wind up on E! television as a True Hollywood Story about serial killers. The Pediatric camp wants to know how much weight they’ll gain from playing 2 hours a day instead of being outside. The Growing up response again has no comment because I’m a girl and too old to have dealt with this issue in my own childhood. Ok, I’ll admit it. My career has warped me into an overly neurotic, lizard-hating, heelie-avoiding, E-rated un-fun (but safe)parent that I am today. Today was one of those insanely busy days, the kind that I had never come close to encountering prior to having my first child. On top of my regular clinical duties, I had additional responsibilities that had been "saved" for me since I couldn't do them while (inconveniently) out on maternity leave. The end result was that I ran around like a headless chicken trying to round with my housestaff, see consults, see clinic patients, fit in two pumping sessions, and deal with some seriously crazy patient scenarios, straight out of Grey's Anatomy. Today, multi-tasking was the only way I could survive. I seriously had almost no time to sit still, I barely ate lunch (two hours after I initially heated it in the microwave), and always, always took the stairs. My most peaceful moments were, coincidentally, while pumping. At least then I had no choice but sit in my office and internet surf or read my email (probably against OSHA regulations to walk around the corridors while pumping). Of course, during my second pumping session, I actually paged the resident I was working with on consults to discuss our patients, you know, seriously multi-tasking. I made no excuses for the background whirring noise. "I'm pumping," I announced unceremoniously at the beginning. There was no time to be modest. She chuckled. "I've so been there." Which is why I love working with housestaff who are mothers themselves. There's an unspoken understanding. Whenever we go to Toys R Us, my husband and I always gaze wistfully at the toys for older kids. We can't wait until Melly is old enough that we can buy her some awesome toys for us to play with. There's only so much fun we can have with a rattle. Me: "And look! It comes with a little pink doctor's bag!!!" Husband: "Do you want to buy this for Melly or for you?" Me: "Ooh, there's a pink penlight too! Do you think it actually shines light?" Husband: "You know, you have real versions of all this doctor's equipment." Me: "Yes, but mine isn't pink." Also, I'm missing my otoscope. Tell me, how hilarious would it be if I were examining a patient's ear and I pulled out that little pink otoscope? Answer: very. I kind of feel like a failure when I bring Melly to the doctor. Because, you know, I'm a doctor. (Sort of. That's what it says on my badge.) So naturally I should be able to diagnose any medical problem that comes up. Then prescribe amoxicillin to treat it. My current excuse for my poor pediatric diagnostic skills is a lack of proper equipment. I don't have the tiny stethoscope like my pediatrician's. (And I'm fairly sure the stethoscope I use for work is colonized with MRSA and every other bug I've come across in the six years I've owned it... it's pretty much a petri dish. Melly tried to lick it once and I almost had a heart attack.) Also, I left my otoscope at my mother's house and there's absolutely no possible way I can get it, short of some sort of experimental matter transportation device (a la The Fly). Yeah, if only I had my otoscope, it would be NO PROBLEM to stick that thing in her tiny ear to visualize her eardrum while she's flailing about wildly. Because I was just so good at it as a med student. The sad truth of the matter is that I'm lucky if I can even get a temperature for her. That ear thermometer we bought is very suspect. I took her temperature on it once and got 102.4, then took it two seconds later and got 97.5, so what am I supposed to do... average the numbers? Part of the problem is probably that I have too much knowledge for my own good, but not enough knowledge to do anything useful. Like when she's drooling a lot, instead of assuming that she's teething, I think to myself, "Oh my god, is this epiglottitis?? Will this require intubation???" And slowly I lose my mind. I recall in med school that my worst exam grade was in my pediatrics rotation. Damn, if only I had studied harder... I could have saved myself so many $20 copays. ...by compulsion. For the record, the pictured garb were provided by my father. He is a doctor himself, and had to have the grandkids participate in his medical clinic-sponsored float during our home town's fall festival parade. So literally, I was parading my kids around in these. 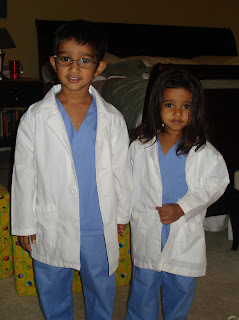 Although I don't have expectations that my kids will become doctors, it would be nice to think that, should they opt to go that direction, I inspired them that way. Of course, my husband is a physician too, so it would technically be difficult to tell who was the primary influence. Okay, I'll admit something. I not only kept my last name upon marriage, but tried to persuade my husband to adopt mine. This was not a battle that I won, nor did I really expect to. I just thought it was worth the argument. Sometimes, though, I think about what the difference would have been if things had gone that way (indulge me for a minute in some unladylike egotism). My kids would bear my name, and if they became doctors, they would be the next (third) generation of doctors in my immediate family with my surname. If people called me and asked for Dr. ______, I might have to ask clarification for which Dr. ____ (and yes, I realize this would also have been the case had I taken my husband's last name, so don't bother pointing that out, that is not the point). Mothers are not so different than fathers, after all. Sometimes we just kind of want our kids to follow in our footsteps. It's a shame though. I guess the world will have to do without two more "Dr. Singh"s.
I'm a highly trained physician, but I can't put drops in my kid's eyes. He fights, and I'm afraid prying open his eyes will hurt the recent sutures. I seriously believe every physician should have children before telling mothers how to give medicines. I used to prescribe 10-day courses of antibiotics all the time. Now that I realize how difficult that is, I would never do it to anybody else. I first learned about the potential dangers of taking herbal supplements in medical school. The point was driven home by a patient with rhabdomyolysis. Another with acute liver toxicity. Many an attending warned us to ask about supplements or instilled the fear that anything could make it's way into an herbal pill, and thus their usage should be actively discouraged. I frowned at the lack of strong evidence supporting their usage. I have to admit that I grouped those who used herbs (and usually it was multiple offenses) as a little bit out there. You know, a crunchier sort, not grounded in science or rigor. My mother, as luck would have it, would fall into that group. She is all about the holistic and the natural. Her evidence has always been in the form of testimonials and N=1 logic. A friend cures constipation with mega doses of Vitamin C? She's on it. Her cousin's babysitter ate flaxseed once and had more energy? Done. A friend of a friend of a friend of a friend (who is wife to a physician!!!!) swears by walking on her hands to cure the hiccups? She asks for how long. I've often wondered how half my genes are from her. I, on the other hand, harbor a healthy fear of supplements, with herbs topping the list. They frighten me because they can very well be biologically active in non-perfectly-elucidated ways. Perhaps it's the complete lack of control in terms of production, dosing, effect, and potency that scare the OCD scientist inside me. Then, there's the fear of hidden toxicity. Who knows what could happen? A couple of years ago, I would have never thought I would ever try taking herbal supplements. No way. Yet, when I started stressing about returning to work and pumping enough to keep my newborn son fed exclusively on breastmilk a few months ago, I read with interest about fenugreek and Mother's Milk Tea. Really? Increase milk production? Mine more liquid gold with every pump? Of course, I didn't look into possible negative side effects at all; I didn't even care. If it meant being able to nurse longer, I would consider trying it. Fear of the unknown and the unaccounted for never entered the equation. I decided to try Mother's Milk Tea. The ingredients include fennel seed, anise seed, coriander seed, spearmint leaf, lemongrass leaf, lemon verbena leaf, althea root, blessed thistle herb, and fenugreek seed. Listing out those ingredients makes me feel like a witch mixing a potion in a cauldron in my backyard. I drank my first cup excitedly, thinking about how much more milk I'd produce that day. It tasted slightly bitter and medicinal, certainly nothing I would voluntarily choose to drink if given the option. Over the next few days, I diligently brewed my herbal concotion and did notice an increase in how much I pumped if I drank two or more cups a day. Maybe. So, now, it's been a little over the month, and I have often wondered aloud why Costco doesn't carry Mother's Milk Tea by the crateload. For my child, I've recklessly turned from a science-based pragmatist into a herbal-tea-chugging junkie who's just looking for her next fix. Which makes me think about how much motherhood (and the compulsiveness to be a "good mother") has changed me. Also, if I grow a third eye, you'll know why.